The changing seasons affect the Fastpitch softball game greatly, specifically winters. Many players are worried about the performance of their fastpitch bats in cold weather. 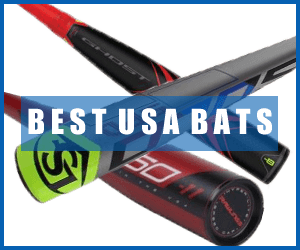 Many questions arise in the mind of a player – like which bat to use in extreme weather, best practices to use the fastpitch bat in cold weather, etc. This is the complete guide covering every matter related to the use of Fastpitch bats in cold weather. What is considered as the low temperature for the Fastpitch Bat? Which Bats are best to be used in the Cold Weather? What is actually happening during the Cold Weather? 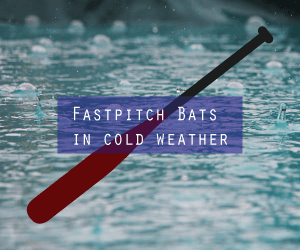 How we can use Fastpitch Bats in Cold Weather? Cold weather is not the perfect time to practice the fastpitch softball games. It is the least liked weather of the softball players because of the harm this season produce to the bats. Cold weather and fastpitch bats have direct adverse relation that means lower temperature leads to the low performance of the bat as well. Not only that but also expect some dents and cracks when using your bat in the cold weather. The fastpitch bat manufacturing industry considers any temperature around or below 60 degrees Fahrenheit to be as low temperature for the bat performance. Some manufacturers even ask to refrain the player to use the bat in the temperature is lower than 50 degrees Fahrenheit. It is highly advisable to not to use your best bat in these temperatures. Aluminum bats are highly not recommended to be used in the cold weather. However, aluminum bats are better than composite bats when it comes to resisting the cold temperature. But overall, one cannot say that aluminum bats don’t get damaged in the cold weather. On composite bat, the impact of cold dense softballs is greater which will lead to cracks in winters. On the other hand, the aluminum bat usually faces dents when coming in contact with the cold ball. There is also an increased chance of aluminum bat to bend in low temperatures. However, the use of both kinds of the bat in the cold weather could harm the bat. Other than these, the fastpitch bats having thin or single wall are also prone to get damaged earlier than the thick ones. The case is not very different for the wooden bats. When the temperature is low, wooden bats also get broken or cracked. In the cold weather, there’s an increased chance of wood become dryer and brittle. When this happens, wooden bats also don’t perform very well in cold conditions. The main factor that causes the bat to crack in winters is the ball becoming denser and cold because softballs and baseballs have string and leather as their major construction. Cold balls hit farther. When the temperature is low the ball jumps off the bat at higher speed. As a result bat flex more due to the hardness. In winters, there is also a chance of more trampoline effect to be produced. There is lots of gain in the distance and pop of the bat when the temperature is cold. An unaltered bat, a rolled bat, or a shaved bat shouldn’t be used at all in the low temperatures – it is recommended by the manufacturers as well. Overall it can be said that it is not a bat that causes the trouble in the cold weather but the softball does the damage. For instance, if you go out to play when the temperature is 60° Fahrenheit but the ball is kept someplace overnight where the temperature is as low as 40 degrees Fahrenheit, you might face a problem when playing. The reason is that the current temperature of the ground is ideal, but your ball is causing the main trouble to your bat in this setting. One way to save your fastpitch bat in the cold weather is to not use it at all. Many people offer to use bat warmers, they are beneficial to some extent but when the main trouble is happening due to the ball, then even warming the bat will produce no positive results. A cold ball can even damage the warm bat. As any cold ball could damage your bat, so I recommend you to not to use your best bat when practicing or playing in the cold weather. If it is very important to use your favorite bat then make sure that the balls you are using are not cold. Overall, decide not to use your bat in cold weather when possible. But if it is essential, then focus on the temperature of the ball rather than the bat.